ny attempt to craft a visual dictionary of art deco style will be limited by the idiosyncrasies of its author. 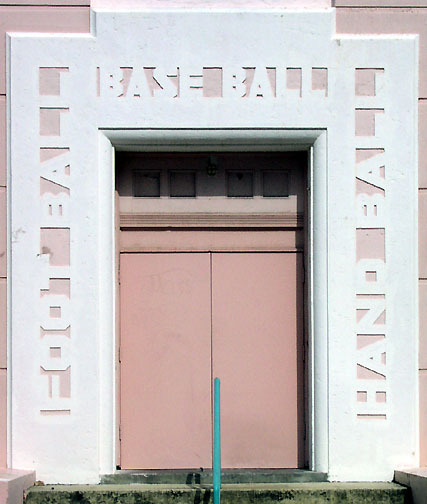 These images were collected from a single source, Miami's South Beach. As such, they reflect a tropical approach toward deco that bears little resemblance to the more somber brick architecture found inland. Even so, the terminology of this dictionary should provide some assistance as you discover deco treasures where you live. Please remember, however, that I am not a trained architectural historian, only a fan. If you have suggestions or comments on how this page might be improved, feel free to email me at: wooda@email.sjsu.edu. In the decorative style, art deco celebrates the power of verticality. 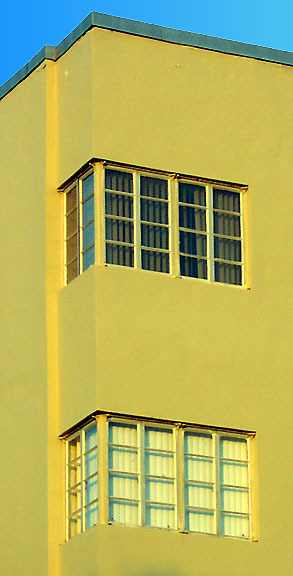 Straight lines that seem to leap upward represent the glorious optimism of the late 1920s. Even in the more subdued streamline style of the Depression era, small bursts of vertical design, such as the raygun-looking detail on the right, reveal an unquenchable sense of enthusiasm. 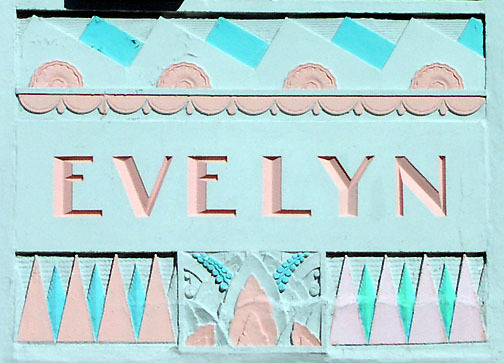 The lettering of the deco period is known for its bold, simple, often blocky design. Take a quick ride through the older parts of most downtowns and you'll find various forms of deco typeface on the facades of Depression era fire departments, factories, schools, and other public locations. 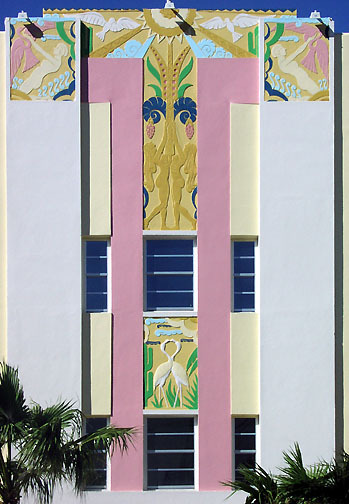 As the Depression wore on, the streamline school began to overtake the jazz-inspired decorative approach. 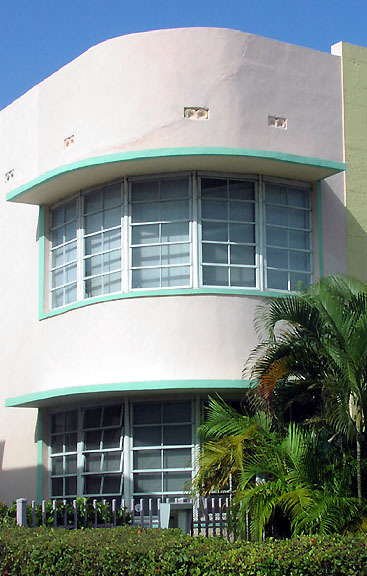 Most notable for its celebration of velocity, streamline moderne buildings may be identified by "speed lines" that suggest architecture designed in a wind tunnel. To the right, you'll find "eye brows" over the windows that further emphasized the horizontal qualities of streamline school. 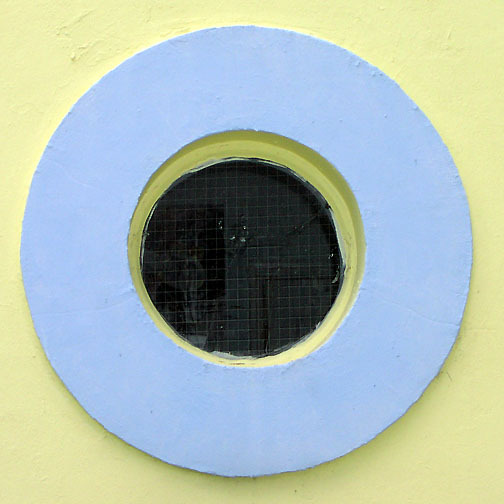 The difference between the decorative and streamline style may also be found in windows. 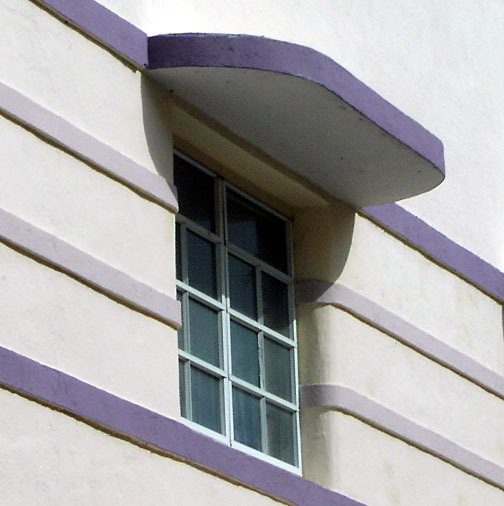 Decorative corner windows, on the left, represent new approaches in building design which allow stresses to be distributed away from building's edge. The streamline school, to the right, showcases the 90-degree curve of wind-tunnel inspired design. 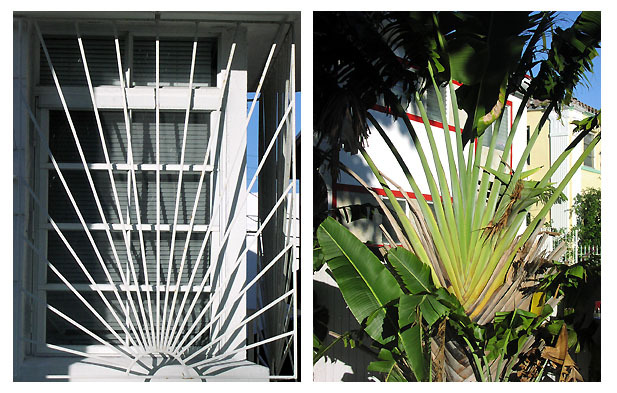 A common theme in deco buildings is the architect's ambivalence toward nature. 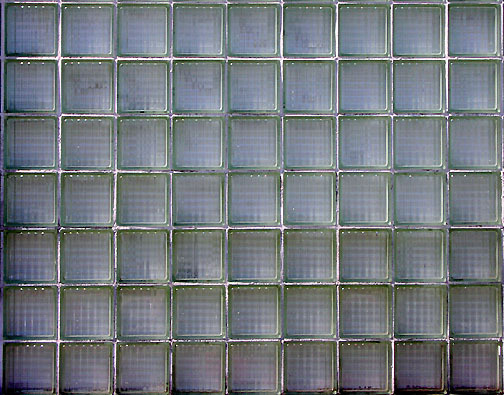 The block glass, to the left, invites sunlight while filtering it through repetitive and subdued design. To the right, we find a comparison between a stylized depiction of nature through sharp lines and its organic counterpart. 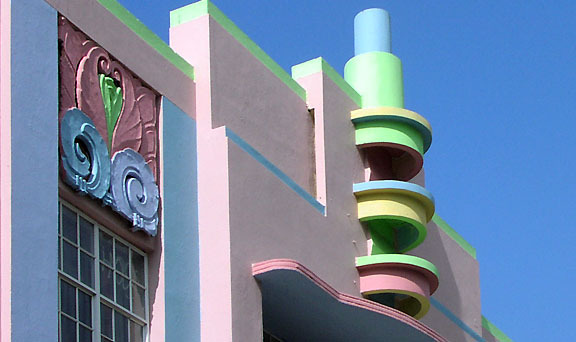 Before the more somber tone of the streamline style appeared to match American attitudes in the Depression age, decorative deco was known for its love of color. In both images, you note the stark style of simple lines and almost geometrical shapes. Deco reflects machine age optimism that human imagination can reproduce anything it sees. 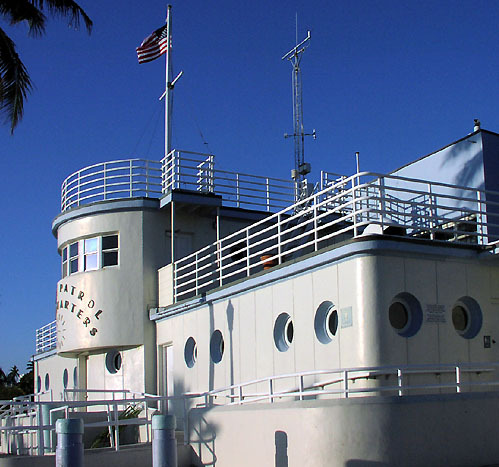 Drawing from the era's love of mechanical invention, deco borrowed heavily from the iconography of advanced technology of its day, most notably: steamships. 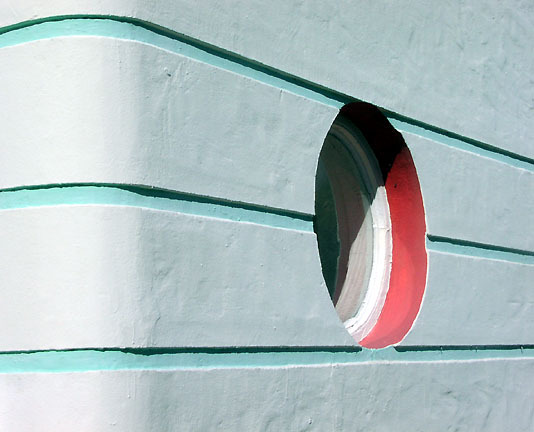 Portholes, railings, entire buildings that looked like beached ocean liners, pay tribute to the deco era's celebration of nautical technology. 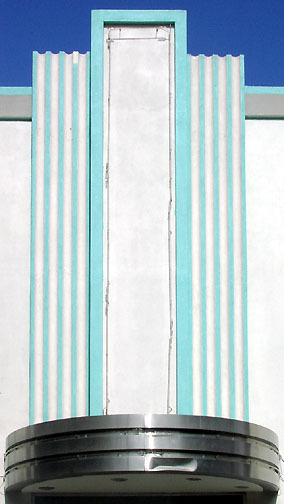 Return to South Bay Deco. Text and photos copyright: Andrew Wood.